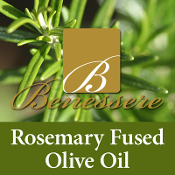 Made with fresh wild Rosemary, this fused herb oil embodies the heart and soul of rosemary. It's both complex and highly aromatic. Use anywhere rosemary might be used. Amazing with poultry, pork or lamb. Spectacular drizzled over grilled or sauteed vegetables and roasted potatoes. Pairs well with Sicilian Lemon White Palsamic and Pomegranate Dark Balsamic. Made with Certified Ultra Premium, extra virgin olive oil blended in small artisanal batches.